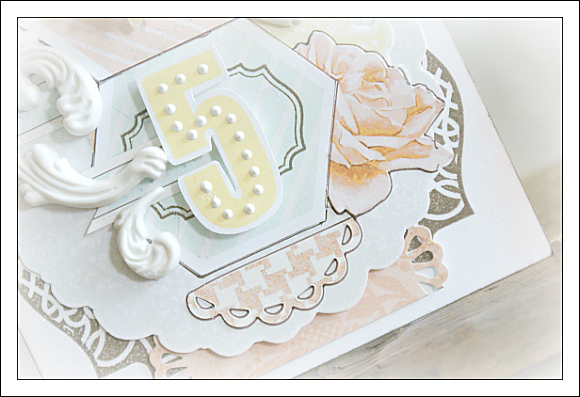 It's Day 3 of TCM stamp previews and I am so glad you stopped by for a little visit! 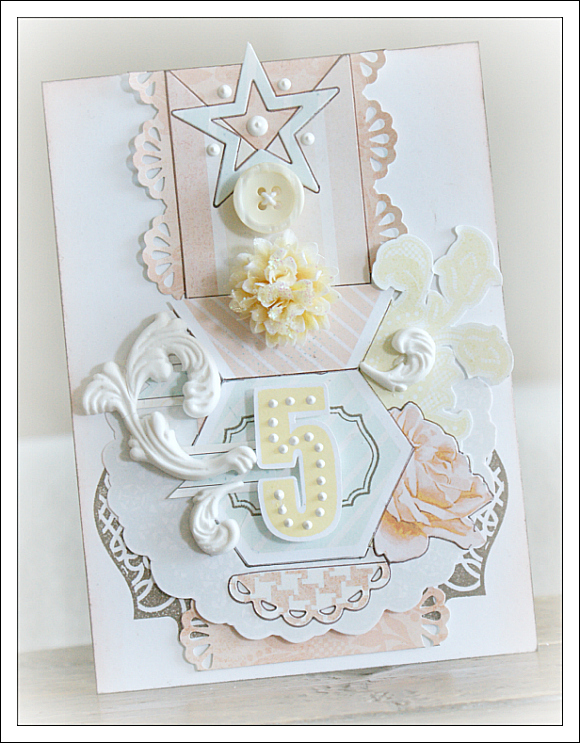 I have a special card to share today, as it is in honor of my little niece, who will be turning 5 this year! As I say that, I cannot believe how quickly the time has gone. It seems like only yesterday that she entered our lives, and she is now well on her way to becoming a grown-up...Well, not quite, but you get the idea! I love her so dearly and I love making projects inspired by her. In a way, we are both so similar and love many of the same things. I added a Prima Gillian Rose (love the frilly petals and the subtle glitter of these flowers), and a button from this Fancy Pants collection. I used a beautiful number stamp from the 'I've Got Your Number' stamp set by The Craft's Meow, and I think this is my favourite numbers set by far! The numbers are a perfect size and the style of the numerals is so lovely. I have a feeling that this stamp set is going to get a lot of use. Seems like no matter how much I search, I seem to only find stickers and paper for 25th or 50th anniversaries... When we all know perfectly well, other birthdays and milestones are just as important and deserve to be celebrated all the same. 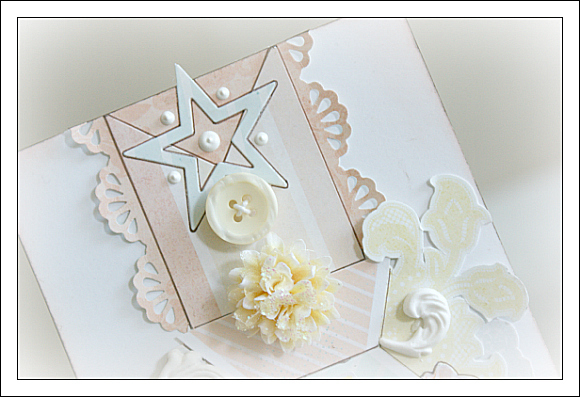 On the card base, I used another TCM stamp set, Lovely Labels 18 which I loooooove so much! The labels are a constant I use in a lot of my creations and the best part is that they coordinate with Spellbinders dies! Well, yet another post is over, and I am already looking forward to the next! Join me back here tomorrow for Day Four! p.s. For a chance to win this stamp set, leave a comment here by 9 pm PST! All winners are announced on the TCM blog the following day! oh wow this is so beautiful i love the flower and the fancy flourishes...so lovely!! another lovely card. I agree that the numbers are the perfect size. I like how you added the liquid pearls to yours. really makes it stand out. You have a knack for such soft, flourishing creations. This is so beautiful-your niece will love it, Ivana. I hope your niece will love this amazingly beautiful card! The colors are so soft, and I agree the size of the numbers will be perfect for odd numbered birthdays and anniversaries. Oh my, what a fabulous card. Lovely color palette and design. Another stunner Ivana. I also love how everything is outlined in the brown.Gorjus. another gorgeous card! love the glittered flower.